It has been far too long since I last posted! I left for vacation with the best of intentions of logging on and sharing a few recipes while I was off traveling, but of course, it never happened. I had some great food while out and about and even managed to snag the recipe for a delicious Thai curry that I promise to share with you soon. I’m also working on getting the recipe for a citrus marmalade we enjoyed in England. If I can get permission to share it with you, I’ll have that one up soon as well. In the meantime, let’s take a look at what to do with all the squash blossoms that should be appearing in your kitchen garden right about now. Each time I have the pleasure of dining at Mozza Pizzeria, I order the squash blossom pizza. It’s my favorite dish on the menu and as I eagerly await any news about Nancy Silverton’s forthcoming Mozza cookbook, I am resigned to trekking to West Hollywood and paying $20 for a pizza. Or so I thought. Saveur’s recent Los Angeles issue was a pleasure to read. I saw some of my favorite places in Los Angeles getting the credit they deserve and learned about some new restaurants, food trucks and taco stands that I must try. 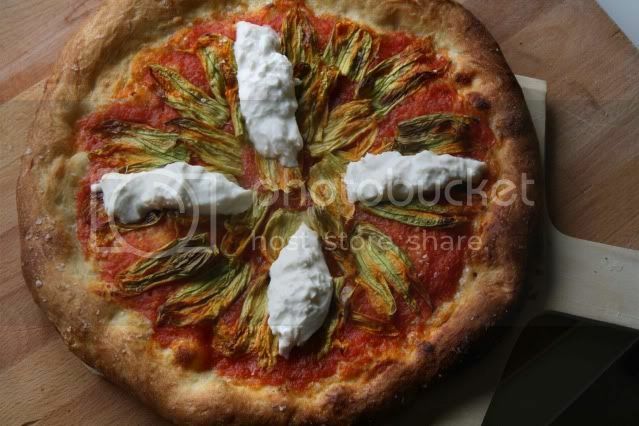 The most exciting discovery was the publication of not only Mozza’s famous pizza dough (adapted for the home kitchen) and not only Mozza’s tomato-based pizza sauce, but the entire recipe for Mozza’s squash blossom pizza. I think it might just be enough to hold me over until the Mozza cookbook is published. In case you missed the Los Angeles issue of Saveur, I feel a sense of duty to share the recipe with you here. This could easily be the best pizza you’ve ever had. Make sure you take the time to track down the best burrata you can find. The creamy cheese, coupled with a healthy dusting of salt is really what makes this pizza so spectacular. Next step? Build a wood burning pizza oven in my backyard so I can get just a little closer to pizza nirvana that Nancy achieves at Mozza. Combine 1T of the oil, the yeast, sugar, salt, and 2 cups of 115˚ water. Let sit until foamy, about 10 to 12 minutes. Add the flour and mix until the dough comes together. Transfer the dough to a floured surface and knead until smooth. Divide the dough into four equal parts and roll into balls. Put the balls on a floured baking sheet, cover with plastic wrap and let sit in a warm place until tripled in size, about 2 hours. Place a pizza stone on a rack in the lower part of your oven and preheat the oven at 500˚ for 1 hour. Transfer 1 dough ball to a floured piece of parchment paper. Working from the center, gently flatten dough with fingertips to a 10" round. Cover the dough with a barely damp towel and let rest for 15 minutes. Brush the edges of the dough with2 T oil and season liberally with salt. 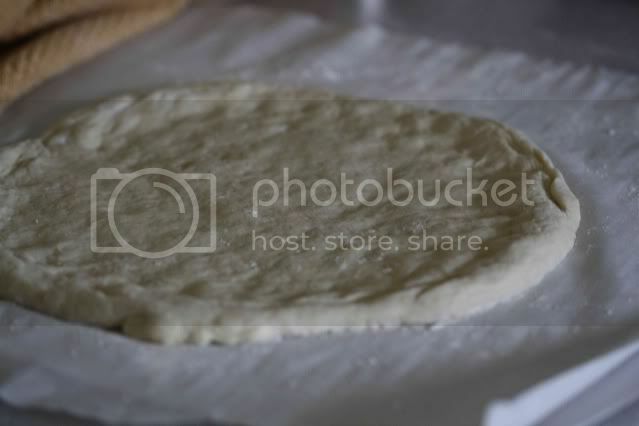 Spread 1⁄2 cup of pizza sauce over the dough, leaving a 1" border. Arrange 15 squash blossoms over the sauce in concentric circles. Place the pizza (still on the parchment paper) on the pizza stone and bake until golden brown, about 10 to 14 minutes. Top with spoonfuls of burrata, a drizzle of olive oil and final sprinkling of salt. Put all the ingredients in a food processor and purée. Season to taste with salt and pepper. What an incredibly visually stunning work of art. It almost looks too good to eat. You're back! Gorgeous pizza. Burrata—I just love saying it! Looks dreamy, especially the creamy white burrata. Looks beautiful! 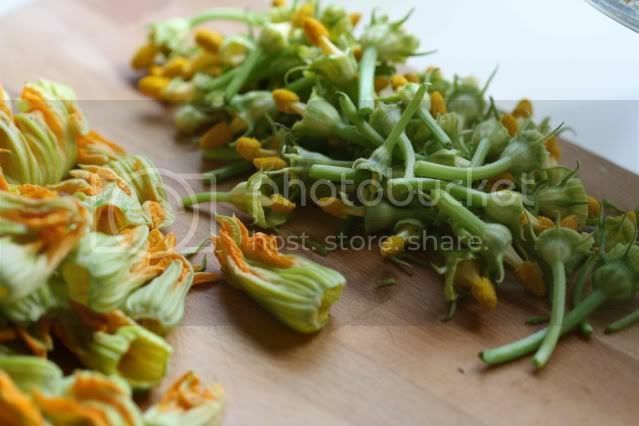 I've only had squash blossom once at a restaurant, would love to try cooking some myself! what i really, really like in this exciting recipe is the sauce: i love that it's not cooked. ten minutes in a hot oven is all it needs for very bright flavors. love it! What a beautiful pizza. It looks like a flower. I shouldn't come to this blog when I'm hungry. Looks yummy! 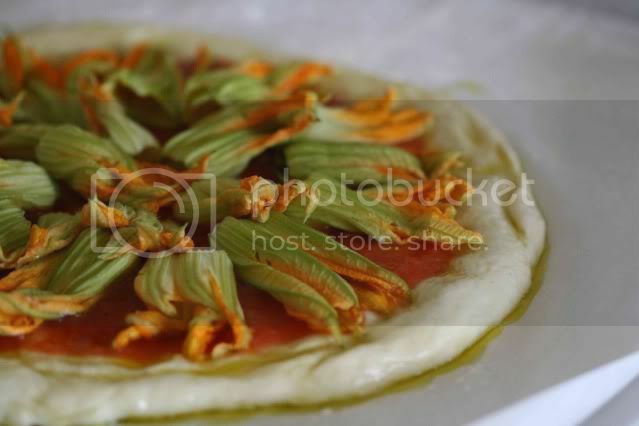 what a stunning pizza, I love squash blossoms and on pizza even buetter!! Beautiful looking dish. What are squash blossoms and burrata? Interesting use of Squash Blossoms. Looks very yummy. You had me at burrata. Seriously, though, that pizza looks fantastic. Well done! What a lovely blog. The photos are gorgeous and the food divine. What should I make first? The squash blossom pizza, the onion tartes tatin, or the duck confit gougeres? Definitely the prosciutto corn cakes! Question, oh better cook than i am. What type of flour do you use? All purpose? Bread? Maybe one could substitute almost any flour, but I'd rather know exactly what type you used if I'm going to try to make this. Hope you get this question and answer it. I'm always up for pizza recipes (I too dream of a brick wood fired oven in my backyard) and have been wanting cook with squash blossoms also, so this is great. Thanks for posting. HOw gorgeous. I have that issue...I bought it for that gorgeous cover! Last time I was in LA I went to Osteria Mozza but have yet to make it to the pizzeria. So pretty! I saw squash blossoms at the Farmer's Market the other day & was kinda wondering what I'd do with them. I didn't buy them, but next time I just might! Welcome back! What a great way to use squash blossoms. I love it. What a great way to use squash flowers. My poor little squash plants are struggling so far this year. I hope I get some flowers so I can give this a try. Hope you enjoyed your trip. Thanks to you I know what we are going to do with the hundreds of squash blossoms we are going to get this summer! You have my eternal gratitude! Such a perfect pizza, it really represent what season are we on. I was reading this issue of Saveur this morning and thinking how good this pizza looks - wish I could make it over to LA to try this and all the other amazing looking food from the issue. Tender - squash blossoms are the lovely yellow flowers on a squash plant. There are both female and male. The female blossoms will eventually turn into squash so you want to leave those alone if you can, but the male blossoms are there for the taking. You can tell a male blossom because it has a long stem and doesn't sit directly on the plant. Hettar - in this recipe I used all purpose flower because Nancy Silverton told me too and I don't mess with the queen of bread. Sorry I didn't specify which flour! I ate at Mozza last summer and have been dreaming about it ever since. I was at mario's new York Pizza place (Enotecca) in the fall but just not the same as the LA place. There is something about that crust that is heavanly. Now I have the recipe!! Thanks so much. For pepper, I advise you a fragrant pepper, Kampot Pepper. It grown in a small area in Cambodia, and it is very delicious.